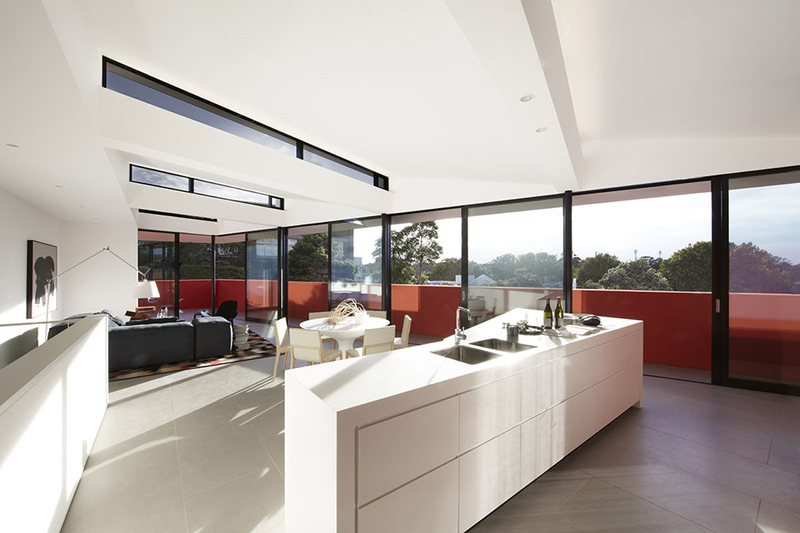 Austin is the refurbishment of a rundown warehouse into a new mixed development in the heart of Surry Hills. 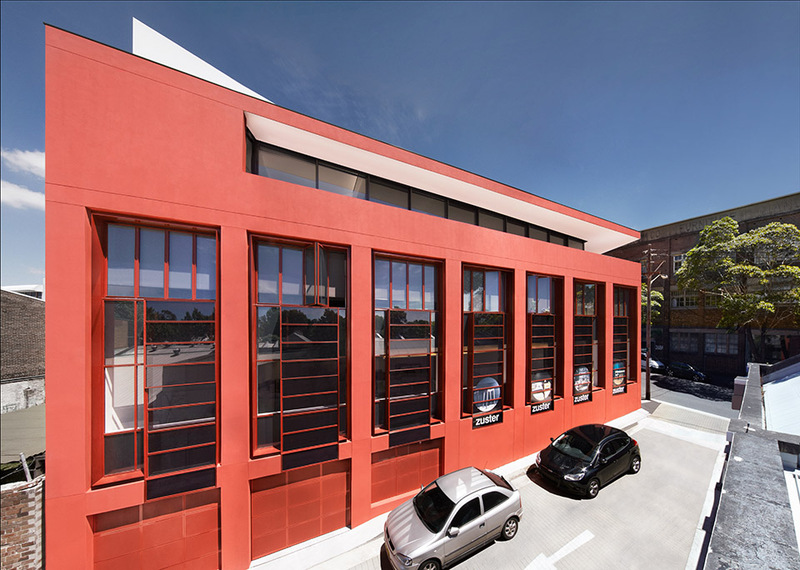 The existing warehouse building has been given a new lease of life, reorganizing its interior with a new extended ground level commercial space, two levels of high quality residential apartments, and a lower ground floor car park. The site is located in the inner-city fringe of Surry Hills, which is characterised by warehouses and Victorian terraces houses that in recent years have housed artist’s studios, galleries and creative work spaces. ↑ We’ve retained the original company name on the building Brackenbury and Austin. Originally a warehouse for a timber yard and the manufacture of Lathes the business ceased producing equipment in the late 1950’s and the building has had a very varied from then until this recent transformation. Flush double-hung on the lower part, allowing the commercial space open up to the street and public domain. 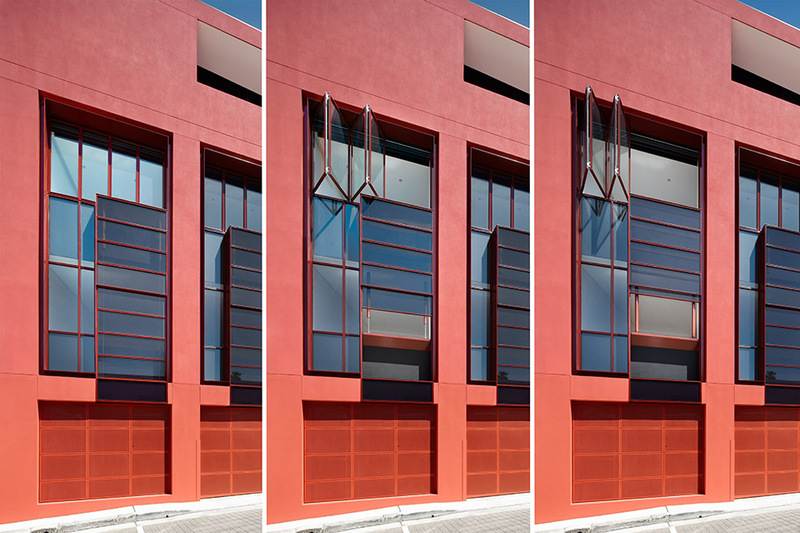 Each of these seven small windows has a slightly different location relative to the grid of larger windows. This is best described as an “eclipse” and was conceived as a subtle art based façade, the kind that we hoped would only be noticed by people who took the time to really study the facade, or even reveal itself over time. 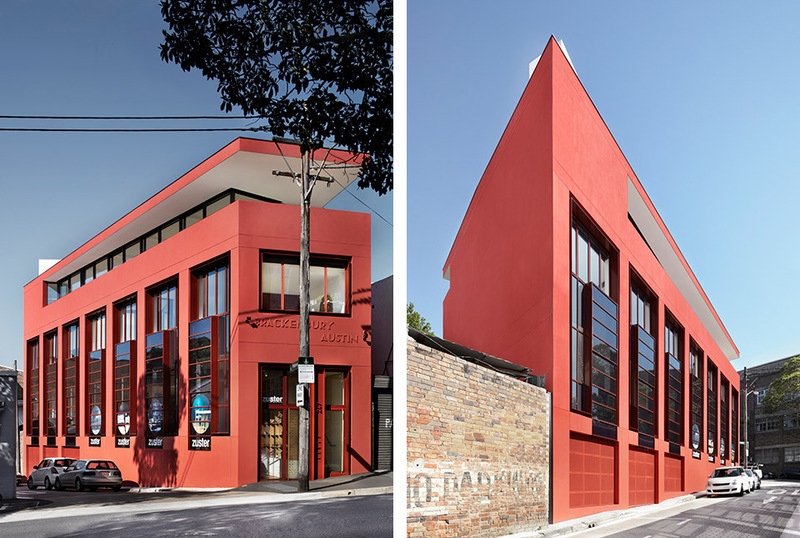 In rust red, to compliment the Hot Chile render, which is similar to the original colour of the building, and provide it with a distinct identity that compliments the bohemian character of Surry Hills. 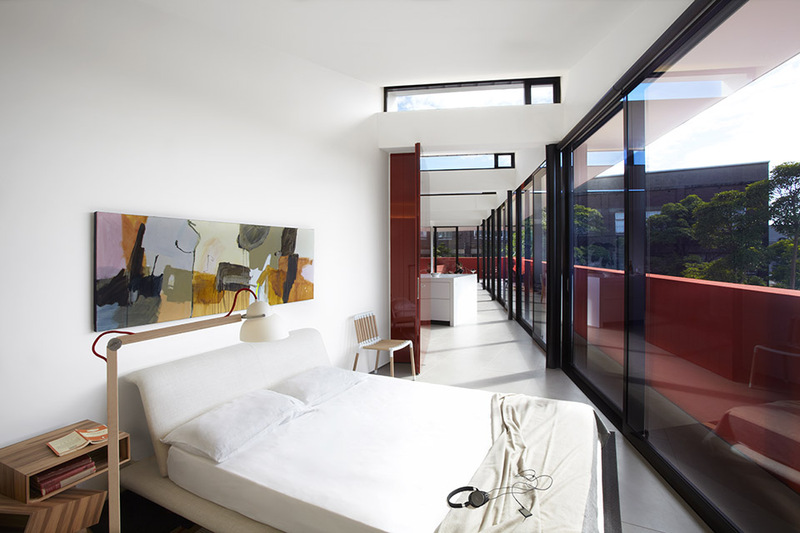 The apartments are simple, beautiful and light filled. Working within a wedge-shaped context has meant that each apartment is different from one another, although the material palette is consistent. 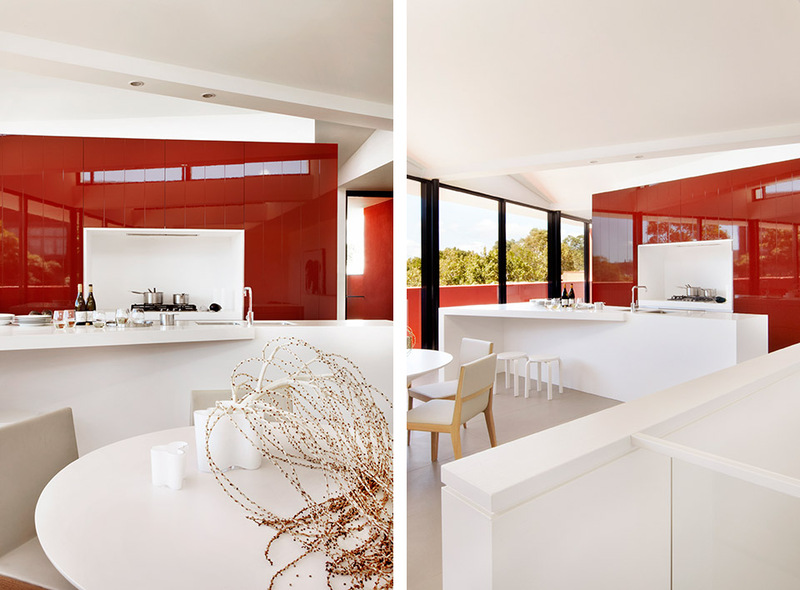 The all-white, exquisitely detailed, interiors with grey floors are accented with full-gloss rust joinery. This is the focus of the apartments and presents as a pod to incorporate kitchens, laundries, studies and an abundance of storage. 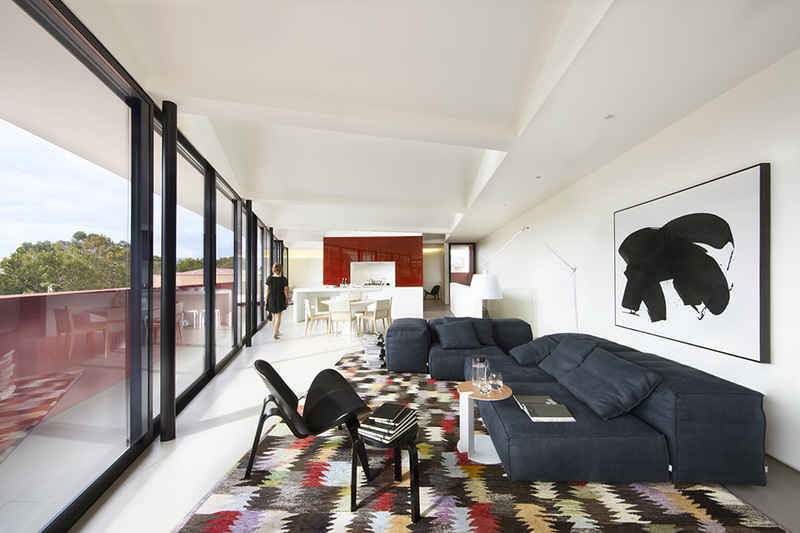 The penthouse apartment, with large rooms, stair void, saw-tooth roof and generous cantilever is a very special interior space with sweeping views over Surry Hills. The penthouse has a generous balcony running the length of the front and side of the building and the roof area covers this balcony offering protection from the harsher weather elements and creating more entertaining and outdoor living areas. 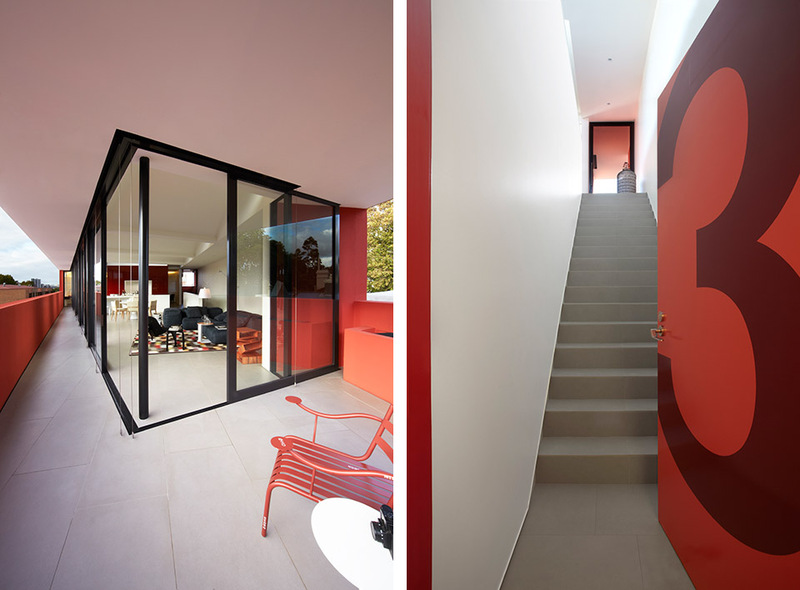 The Smart Design Studio principles of apartment planning, where utilitarian elements are concealed and reliance on doors is minimised are adopted. 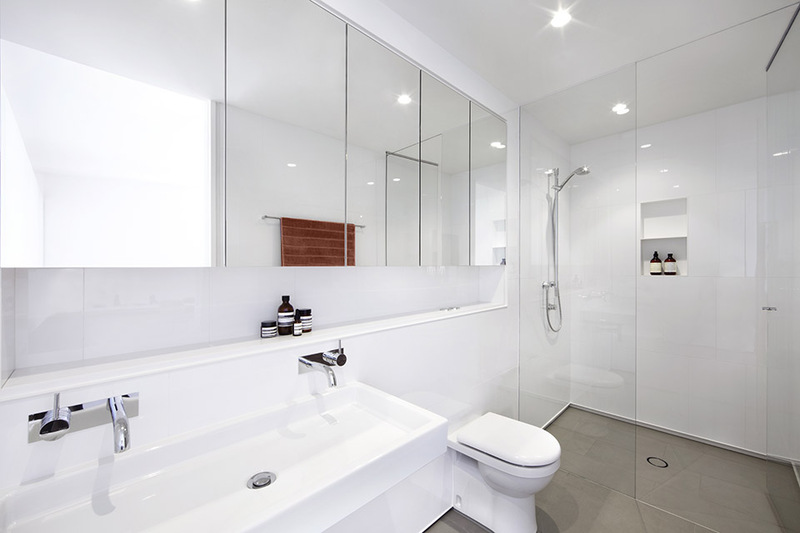 This, along with careful consideration for circulation and flow, creates elegant apartments that feel easy to live with. The basement commercial area is split level floor with an abundance of light and was originally conceived as a restaurant space though it is now utilised as a successful retail store. The forms and details employed within this space reinforce the arechtiecture of this building, which is to have chunky warehouse character, through exposed concrete beams and slabs, complemented by refined forms, refined details and unusual combinations of materials. We’ve retained the original company name on the building Brackenbury and Austin. Originally a warehouse for a timber yard and the manufacture of Lathes the business ceased producing equipment in the late 1950’s and the building has had a very varied from then until this recent transformation. Performance glass, concealed spandrels and external roller blinds. Rain water collection and reuse for flushing toilets and watering plants. Through maximizing the reuse of the existing building.